You’re invited to the First Friday festivities in Downtown Los Altos on February 1st, 2013 from 6-8pm. “Valentines Sweets Tour” is the theme of the evening. The evening packs in a number of great activities for visitors of all ages. * Browse and shop at the open stores and galleries, many providing First Friday discounts and scrumptious refreshments and beverages. * Enter the drawing for many gift certificates donated by local stores and restaurants. A few of the musicians performing include 37th Parallel, The Latin Band, Woody Arnold. You can enter the First Friday drawing for merchant gift certificates either by purchasing merchandise during the First Friday (get one drawing entry per $25 spent that evening) or by participating in the “Find the Sweets” game. The First Friday headquarters at 164 Main is the place to pick up programs, get information, and register for the drawing. Mark your calendar for this fun evening, beginning at 6pm. And as always, over 20 downtown restaurants will be open and serving a wide selection of cuisines. All activities are indoors so rain will not dampen the evening. Plenty of free parking. This First Friday is sponsored by the Los Altos Community Foundation and the Los Altos Town Crier. 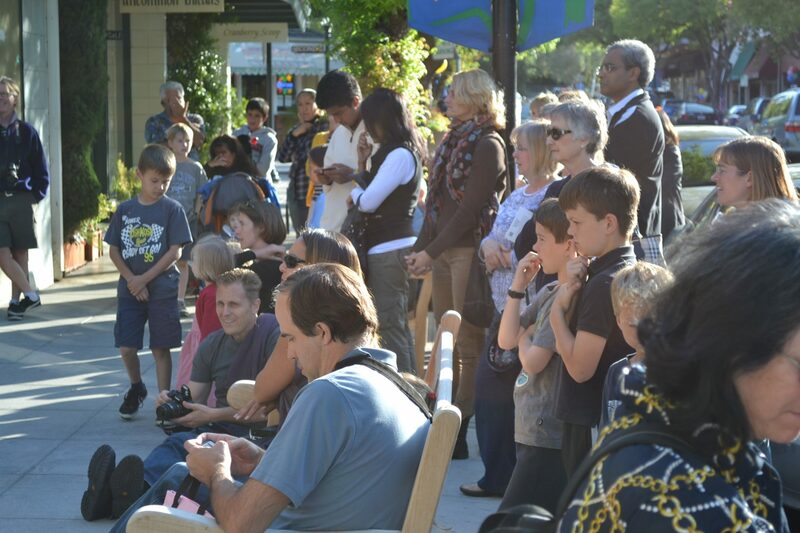 First Fridays are organized by Los Altos Forward, a volunteer group dedicated to promoting vibrancy in our downtown. First Fridays are one of the group’s initiatives and provide a fun, social, and community-building evening for residents of Los Altos, Los Altos Hills, and surrounding communities. For more information about First Fridays visit losaltosfirstfriday.org or email info@losaltosfirstfriday.org . Join us for the December 7th First Friday! • Browse and shop at the open stores and galleries, many providing First Friday discounts and scrumptious refreshments and beverages. • Jump on the locomotive and enjoy a free ride around downtown. • Play the fun “Find the Train Ticket” game. • Enter the drawing for many gift certificates donated by local stores and restaurants. Get an entry ticket either by purchasing merchandise during the First Friday or by participating in the Train Ticket game. • Come enjoy beverages, refreshments, and lively music at the Holiday Party, 359 State Street. Refreshments, beer and wine will be served. The First Friday headquarters is the place to pick up programs, get information, visit Santa, register for the drawing, and beginning at 7:30, attend the holiday party. Mark your calendar for this fun evening, beginning at 6pm. And as always, downtown restaurants will be open and serving a wide selection of cuisines. All activities are indoors so rain will not dampen the evening. Plenty of free parking. Sponsors who generously contributed to the First Friday event include. • Platinum Sponsors include BK Collections, Los Altos Community Foundation, Nature Gallery, and Passerelle Investment Company. First Fridays are organized by Los Altos Forward, a volunteer group dedicated to promoting vibrancy in our downtown. First Fridays are one of the group’s initiatives and provide a fun, social, and community-building evening for residents of Los Altos, Los Altos Hills, and surrounding communities. Los Altos Forward is a program of the Los Altos Community Foundation. For more information visit losaltosfirstfriday.org or email info@losaltosfirstfriday.org . Many merchants participating in the November 2nd First Friday! Visitors can shop at the open stores and galleries from 6-8pm. Many will be providing First Friday discounts and scrumptious refreshments. The list below details the open merchants and some of the activities they are doing. A number of merchants will donate a portion of their proceeds toward veterans’ causes in honor of the upcoming Veterans Day. Over 20 downtown restaurants will be open and offering fine cuisines from around the world. As always, all parking is free. Participating merchants and some of their promotions are below. A number of them will be donating a portion of their proceeds toward the Foothill College Veterans Resource Center. Los Altos Forward is a program of the Los Altos Community Foundation, www.losaltoscf.org . Mark your calendar for another fun event in downtown Los Altos. Merchants open late, many offering discounts and complimentary treats, music on the streets, fine dining at any of the many restaurants, and plenty of free parking. In honor of Veterans Day, a number of merchants will be donating a portion of their proceeds to purchase equipment for the Foothill College Veterans Resource Center. Come support this important cause. Great October 5th First Friday! This First Friday had great attendance, fun music on the streets, lively buzz at the Candidates’ Corner, and a great turnout for the bier garden which carried on strong until the accordion player packed it in at 10pm. Over 36 merchants were open, many offering discounts and/or complimentary refreshments. Lots of families participated in the “Pumpkin Hunt” to the stores and many of the attendees purchased items that evening, allowing them to enter the drawing. Los Altos First Fridays, © 2019.